One of the big problems of being a kid is that your parents often try to make you play with people you don’t really like. My parents were forever trying to get me to like the kids of their friends. These kids were often weird. I didn’t want to play with them. It was a problem. I remembered that when I was writing the first Ivy + Bean. Ivy and Bean are very different. Bean is loud and wild and goofy. She loves to be involved in games and poke her nose in other people’s business. Ivy is quiet and full of ideas. She spends most of her time learning how to be a witch. Each girl thinks the other one is weird. Each girl thinks she could never be friends with the other. Especially because their parents keep nagging them about it. But sometimes opposites can become the best of friends because they’re opposites. For example, people who like to talk need people who like to listen. And people with great ideas need people who can put those ideas into action. For Ivy and Bean, their differences mean that they have more fun together than they could ever have separately. It also means that, together, they do more wacky things than any one kid could ever dream up. The Ivy and Bean books are about the adventures—and disasters—created by this unlikely team. And since their motto seems to be “Why not?” there’s every reason to believe that their capers and catastrophes will continue for quite a while. Both girls were sure they would never like each other, but when Bean finds herself in a pickle, Ivy helps out with a magical spell. 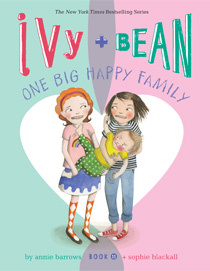 The results are glorious: Bean’s sister Nancy loses her mind, and Ivy and Bean become forever friends. Ivy discovers that there’s a ghost in the girl’s bathroom at Emerson School. What could be cooler? Nothing, until the teachers find out, and Ivy gets in trouble. The girls have to get rid of the ghost, and quick. Potions—and plumbing—come to the rescue. Bean wants to break a world record, but all she seems to be breaking is dishes. Out in Bean’s backyard, Ivy and Bean dig up a pile of ancient bones and discover that they are record-breakers: they’re the youngest paleontologists in the world! The problem is that nobody believes them. What’s the worst babysitter you can imagine? Okay, now multiply by a million. Bean’s just found out that Nancy is babysitting for the afternoon. After Ivy rescues her from prison, the two girls turn tragedy into opportunity. Ivy has decided to become good. Extra-super-duperly good. Bean figures that’s a big waste of time—until Ivy explains that if you’re really good, animals and birds follow you around. Wow! Animals and birds! Bean’s going to be good, too! They’re going to be nice; they’re going to be sweet; they’re going to be kind and generous and—Wait a second! How did they end up muddy, wet, and in trouble? Ooops. Ivy and Bean have made a terrible mistake. They thought that ballet meant leaping, kicking, and cool costumes. Instead, it means they’re going to have to be The Two Friendly Squids in a ballet the teacher made up. How embarrassing. As disaster looms, the girls come up with a great escape plan. It’s an easy plan, a simple plan, a beautiful plan. It only involves a field trip, a couple of sharks, and some weird animals that glow in the dark. Book 7: Ivy + Bean: What’s the Big Idea? Wouldn’t it be cool if Ivy and Bean found the solution to global warming? Wouldn’t it be especially cool if the solution was shimmering pink goo in a test-tube and all the famous scientists in the world wished they had thought of it first? It’s Science Fair time at Emerson School, and all the kids are supposed to find a way to cool down the earth. Some kids are planting trees. Some kids are holding their breath for a very, very long time. Some kids are doing interesting things with vacuum cleaners. But what should Ivy and Bean do? Something with explosions? Something with ropes? Something with ice cubes? Or maybe something very, very quiet . . .
Ivy and Bean need some money. Ten dollars, to be exact. Never mind what for. Don’t even ask. Okay, it’s for cheese. Two bags of lowfat Belldeloon cheese in a special just-for-you serving size. Don’t ask why. But ten dollars is a lot of money. How are Bean and Ivy going to make ten dollars? Should they babysit? Eww, diapers. No. Should they wash the car? They’re not allowed to touch the car. No. Should they write a newspaper about their neighbors and sell it? Yes. Great idea—and easy too! All Ivy and Bean have to do is snoop around Pancake Court and gets some news. It’s very interesting what you can find out if you look in your neighbors’ windows. It’s even more interesting when the neighbors read about it in the newspaper. It’s Spring Break, and Bean’s older sister, Nancy, is going to Girl Power 4-Ever Camp, where she will do Crafts and Dance and First Aid and other secret things that Bean will never know about because you have to be eleven to go to Girl Power 4-Ever Camp. Bean doesn’t care. She doesn’t want to go to camp. She wouldn’t go even if they begged her. So ha. So ha ha. So—wait a second! Bean and Ivy can make their own camp, their own better camp. It’s Camp Flaming Arrow, where Crafts include escaping, Dance includes thumbtacks, First Aid includes zombies, and counselors Ivy and Bean make the rules. Life is filled with unsolved mysteries, puzzling events, and perplexing questions. Luckily, Bean, Private Investigator, is here to help. She’s tough as shoe leather! She laughs at danger! She knows how to dust for fingerprints like a champ! She and her assistant, Ivy, can solve any mystery you have lying around. What? You have no mysteries? The kids of Pancake Court thought the same thing. They even laughed at Private Investigator Bean. They laughed until Private Investigator Bean and her assistant Ivy discovered the mystery that lurked in the heart of Pancake Court. The kids of Pancake Court weren’t laughing then! It’s a good thing that P. I. Bean and her assistant Ivy were ready, willing, and able to take the case. Do you know a kid who won’t let you play with her toys? A kid who yells at his mom? A kid who eats your play lipstick? Those kids are spoiled, spoiled, spoiled, and nobody likes spoiled kids. Ivy’s sure she’s on the brink of spoiledness, and she’s got to stop it before it starts. Luckily, she knows just what to do. It’s going to take some string, some electricity, and a little dancing. Should be easy peasy, with Bean’s help. Ivy and Bean have some questions for you! Like, for instance: Would you rather break your arm or your leg? Which of your friends can hold her breath the longest? What’s the most money you ever found on the sidewalk and what did you spend it on? This fill-in-the-blank book will give Ivy and Beanies plenty of interesting ideas to think about, as well as some fun ways to keep from being bored, and some story starters, so they can write their own Ivy + Bean books. I can’t be doing all the work around here. If you can’t find the Ivy + Bean books in your regular bookstore, you can order them from Chronicle Books by calling 1-800-722-6657. For more fun stuff, go to Chronicle Books’ webpage on Ivy + Bean. Oh boy, look at this cute little video about Ivy + Bean!